Rhode Island facts and history plus travel and tourism information. Rhode Island, the smallest state in the USA, was once inhabited by Narragansett and other Algonquian-speaking peoples. In 1636, Europeans set up their first permanent settlement in the area at Providence, Rhode Island. Providence's founding was initiated by Roger Williams, a Christian minister, and many people seeking religious freedom settled in Rhode Island. On May 29, 1790, the "State of Rhode Island and Providence Plantations" became the 13th state. With many islands, Rhode Island's economy grew from fishing, shipbuilding, farming, and trade. Textile mills arrived during the 19th century; in the post-World War II era, machinery, jewelry, and silverware were produced in the state. Higher education and service industries are important to the Rhode Island economy today. At one time, Newport, Rhode Island was a summer playground for the wealthy. 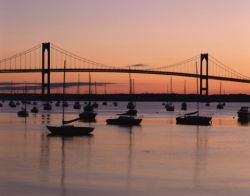 While many of Newport's mansions have been preserved for their historic significance, vacationers still enjoy watersports in Narragansett Bay and at the Atlantic Ocean beaches.